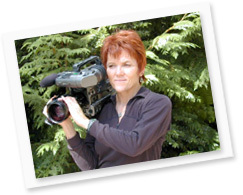 Ann Mendenhall is an artist and independent filmmaker. In 1997, she founded the production company Redwave Media, LLC. Since that time she has produced, shot and edited award-winning projects, ranging from independent features, shorts, documentaries and commercials, to educational and training videos. Her work has been shown in festivals, galleries, theaters and museums from New York to Los Angeles. Some of her clients include Discovery Channel, University of Washington, Harborview Medical Center, Microsoft, Safeco, Virginia Mason Hospital and Children's Hospital. Her documentary work has taken her across the globe to places such as Siberia, as well as throughout the United States. She holds a BFA in Painting and a MFA in Video and Performance. She has been on the faculty of colleges and universities in both the Fine Arts and Film departments. She is an Apple Certified Trainer in Final Cut Pro and teaches at both Moviola in Los Angeles and 911 Media Arts in Seattle. She has also worked for various companies and individuals as an editor consultant and trainer. She looks forward to collaborating with you on your next creative endeavor.